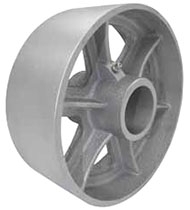 Cast Iron or also called Semi-Steel wheels offers a strong, durable, cost effective solution for heavy loads. Hard tread rolls easily and offers high abrasion resistance. Tread face is precision machined for a smooth, ride, tread edge is machined round. Hard on floors and have a high heat tolerance if used with high temp grease. Each Wheel Size has a specific hub design .